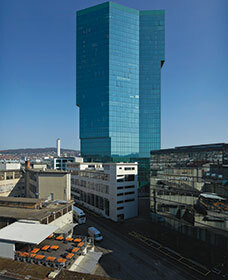 Jutting up to a height of 126 m, the 36-storey Prime Tower is Zurich’s tallest building and number two in Switzerland. Its 40 000 square metres of floor space can accommodate more than 2000 workplaces. It is striking with its futuristic architecture and dark green reflective exterior. The tower’s impressive details include a 10 m-high entrance hall and the CLOUDS bar and restaurant on the top floor boasting an unmatched view far out across the surrounding landscape. The operator relies on Bosch to keep the building safe and secure. And to meet the Prime Tower’s requirements, the company’s experts recently implemented a modernisation project. One of the new system’s technical highlights is a combination of electronic and biometric access control. “Our owner, the firm of Swiss Prime Site Immobilien AG, attaches great importance to monitoring who exactly is inside the building at all times,” explained Annika Hammes, who heads the trustee department at Wincasa, a building services outfit that was contracted to design and execute the solution. “Error-free biometric identification is accomplished by reading the vein patterns on the backs of people’s hands. This is done contactlessly for very easy, comfortable use. A total of 120 hand vein readers have been installed in the building and connected to the controllers of the eight elevators. Once employees and guests have been biometrically registered, they board lifts that automatically take them to the right floors. Encrypted ID cards are used to access the rental units, thus making sure that persons can only enter zones for which they have been authorised. All relevant security information is collected in a management system so that the responsible employees always have everything in view and can respond quickly when there is a need. Bosch handled everything for this project: advising the client, and then planning and implementing the system. The modifications were made without interrupting use of the building, which was a major challenge not only for the project team, which therefore had to work very swiftly, but also for the tenants themselves. “This called for very close cooperation between the Bosch team and the mixed-use site management (MUSM) team of Wincasa AG, which met the requirements for continued building use while the work was ongoing,” explained Hammes.